Your Shopping Cart is empty now. Chlorophyll is the natural green pigment in plants used to convert light into energy. It is super good for you, and Chlorella has a higher content than any other plant, making it perfect for your daily dose. Our Chlorella is packed with protein and vitamin B12, which are proven to maintain muscle mass and normal bones, support the normal functioning of the nervous system, reduce fatigue and more. There is nothing unnatural in our Chlorella, which is grown in pure waters in the South China Sea. It contains no allergens, irradiation or GMOs, it is certified organic and suitable for vegans too. Our Chlorella is a premium variety that is grown in pure, clean water and packs a serious nutritious punch. You will not find better quality anywhere else, so you can buy with full confidence that you are getting the best. We always want our customers to be 100 percent happy, so if you have any problems with your Chlorella, please just let us know and you can return it for a full refund. Our Organic Chlorella comes from the dark green natural algae grown in pure waters in an island in the South China Sea. A highly regarded superfood, it is popular for its highnutritional content and organic purity. With one of the highest amounts of chlorophyll of any plant on Earth, and even higher than Spirulina, Chlorella is the perfect way to get your dose of this dark green pigment forgreen goodness in every meal. Our premium Chlorella is packed full of nutrients that are proven to be beneficial for your health. Chlorella is a potent source of protein, which is important for growing and maintaining muscle mass and maintaining normal bones. It is also packed with vitamin B12, whichsupports the normal functioning of the nervous system, contributes to normal blood cell formation and reduces fatigue. Our Chlorella comes from natural and organic green algae grown in pure conditions on an island in the South China Sea. Certified organic by the Soil Association, it has all thegoodness you need without any unwanted extras thrown in. With no irradiation, GMOs and allergens, it is suitable for anyone who wants to maintain a healthy and natural diet, and it is also 100 percent suitable for vegans andvegetarians. Our Organic Chlorella is one of the highest-grade chlorella products you can buy. It is easy to add to your diet by simply adding it to your favorite smoothies, shakes and juices. So try it today and enjoy a green detox. And remember, we will always be happy to provide you with a refund if you are unhappy for any reason, so all you have to do is contactus. At MySuperfoods, we only select the finest strains of all our natural health foods. These are grown naturally and organically in pure conditions, and they are never intensivelyfarmed, ensuring a higher nutrient count. And because we provide only the nutritious, you can enjoy with full confidence. SERVING SUGGESTIONS: Recommended portion size: 10 to 15 grams per day, depending on requirements. As always, please consult your doctor before taking any nutrient-dense supplements. FRIENDLY FOR EVERYONE: We want everyone to enjoy the benefits of our organic chlorella powder equally, which is why our product is also 100% safe for those with special dietary needs. Vegan and vegetarian friendly, dairy and gluten free. SATISFACTION GUARANTEE: If you aren’t completely satisfied with our product, simply get in touch and we'll show you how to return it to MySuperfoods. Keep in mind, we offer a no-questions-asked, 100% money-back-guarantee within 30 days of purchase. Store in a cool, dry, dark location in a sealed pack. Pear, kale, orange, banana, almond milk and chlorella smoothie - the best breakfast in the world! I use 1 heaped teaspoon. trailing this item as part of improved health regime and mostly used in smoothie options. Noticed improved complexion and energy levels and improved general well being. Being used as part of other product in terms of health drinks etc. Feel much better for taking same. Great stuff! Mixes really well and the benefits are amazing. Definitely among the best I've had and the price makes this a steal! Very happy with it. This is a very good quality organic chlorella powder at a very good price... wondering if you offer discounts for multiple packs? A really good purchase and will be buying more when I start running low. I use a teaspoon full when I make a fruit and vegetable smoothie. Really good stuff for keeping colds and flu at bay and general well being. Very good, can now see the benefits, but taste takes some getting used to. Well, it smells and tastes like fish BUT I'm not sure why a lot of people would expect anything else. For me, i take it twice a day, I break it down into two teaspoon dosesso that it's easier to mask the taste and it is a lot more easier for my body to absorb the nutrients. One teaspoon in in my coffee every morning and 1 teaspoon in my water during dinner. You'll just have to swallow quickly and be done with it. I add a 1 teaspoon to my drinks especially on my fruit shakes. It definitely packs a punch. I used to be anemic. Now my blood results are normal... I feel full when i take this. whats even great is that i dont have any unpleasant side effects unlike other iron supplements i was using before. Wonderful product. I am very happy with this chlorella. I had bought like this before on other companies and it was so expensive. This is much better and larger quantity at the best price I could find. I will be shopping here again. Chlorella helps remove toxic metals from your body and other chemicals you may have been exposed to. You can trust the quality of MySuperFoods products. They have the most reasonable pice in the market. My body responded amazingly to this product. I feel energy coming back. I'm a repeat buyer, always extremely satisfied with product. Great packaging and shipment was fast. Great stuff. I Have been using for several years, and I it really helps. It helps with irregularity and provides an energy boost.Mixing it with a smoothie is the best. Do feel better after taking it! I take this every morning and I feel like it cleans me out completely. i have been using for two weeks now. It's well worth it. High quality chlorella. Helps your skin. Feel really good drinking this regulary. Only been using a few days but already feeling the benefits. Very good product blends well in fruit juice. Smells like dog food but does the job. I use this every day in my smoothies and sometimes I just mix it in water and use it when I take my supplements. It has helped me with my overall health and has given me more energy. I do mix it with other herbs when I take it. I do highly recommend it. Best and most economical form of wheatgrass.I recommend this to anyone looking for overall better health, needs that extra jolt of energy in the morning, or anyone wanting to lose weight. I use the a teaspoon of the powder in a daily shake and cannot notice a change in the flavour. Which is good because this stuff whiffs when you open the packet. I trust it's doing some good but haven't noticed a huge difference in health but then again would you? Delivered next day, but it smells quite unpleasant, maybe organic one got to be like this? Next time will try the tablets. These have really made a difference to my mood (hormone related) wouldnt do without them. This is a great way to keep up with adding Chlorophyll to my diet without having to make green smoothies everyday. The letterbox friendly packaging is a bonus! Excellent product. Really notice when Im not using it. Definitely going to buy again. i bought these to add to my Nutribullet 'pond' which i have for breakfast every morning. Always looks like something a frog would happily live in but i seem to have lost 3lbs without trying and i really have the flattest stomach i have every had. I am eating and drinkings completely normally the rest of the time. I was advised by a healer to take these tablets and I was sceptical! I've been taking them for 3 months and boy do they make a difference to me! I haven't used this brand, but the delivery was so quick and I will be buying again. For me my general health has improved dramatically. Nails and skin are so much better. Used to have brittle nails, from years of biting. Now they are strong and the growth is fast. My skin is brighter and less spots and dullness. Sorry about this but, bowl movements so much better to! I also take spirulena powder powder daily too. Doesn't taste great, but ok in a green smoothie/juice. Try the combo for 8 weeks and I'm sure you will see a difference in your general health.???? Energy boost for me, extra walk for the dog! After 3 weeks of taking 6 tablets a day (3 lots of 2 at varying times) I didn't really feel any different. But then on the 4 week thought to myself.."hey..I'll give the dog a second evening walk", as I felt I needed to burn off excess energy. I'm far to alert now to go to bed at my normal time and pretty certain it's down to the tablets! Actually today is my first day to try it, 6 tablets with my breakfast, but I suggest you better BUILD UP your dose so you give your body the chance to get used to it. I felt like not eating all day, did not snack as usual, not tired, no fatigue, but felt a bit strange! !, should have started with just 2 tablets. I have been taking these for just over a week now and can honestly say that I'm beginning feel better.I have had no side effects like some people who posted reviews.I had been taking Evening.Primrose previously but can't say I had noticed any difference in my general health. So I'm going to carry on with the Clhorella as I really have noticed an improvement. I am very satisfied with the results of taking chlorella. I felt more energy throughout the day. So much so, that I actually pulled a coffee out of my bag after work last night and I realized that I dont feel the need to grab an afternoon coffee. I just felt more normal and less drained last night. And this morning, I feel that I slept much better. Chlorella is such a wonderful superfood. It gives a lot of great results. I used to take several different supplements along with multi-vitamins. Now, I just take Chlorella. I just started taking this yesterday. I took 1 tablet after I'd had a long day and was exhausted from work. Hope to see some brilliant results as suggested by my friends who recommended the product. I have been taking Chlorella tablets for a short time only. After a few days I noticed my appetite had lessened. Not that I am desperate to lose weight but it certainly has helped to tone my figure. Very good been taking them for over a week now looks like something you would put in a fish tank. 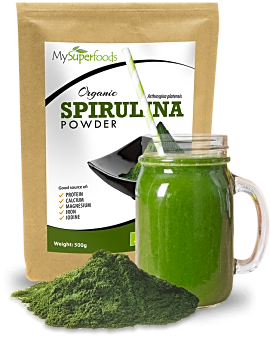 Great product when combined with spirulina all from MySuperFoods. i will continue to buy. However, be aware of the detoxification effects. I had been taking chlorella for about 2 months - feel better, more energy. Copyrights © 2017 All Rights Reserved by MySuperFoods Ltd.